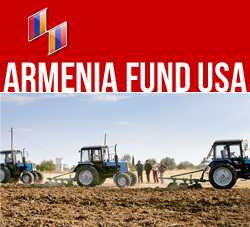 NEW YORK, New York — During the week leading up to the Armenia Fund’s annual Board of Trustees meeting, held in Yerevan on May 14, a large delegation of the Fund paid a five-day visit to Artsakh. Between May 5 and 9 and led by Hayastan All-Armenian Fund Executive Director Ara Vardanyan, the delegation, composed of members of the Board of Trustees and the Executive Board, representatives of affiliates from throughout the world, and benefactors, attended the opening ceremonies of two major projects and visited the sites of several initiatives currently being implemented by the Fund. The opening ceremonies of a newly constructed school in Spitakashen, a village in the Martuni region, and of a newly built water-delivery system in the village of Sos, also in Martuni, were among the highlights of the visit. Spitakashen’s new, two-story school replaces the old campus built in 1935, which had fallen into disrepair and was no longer meeting the needs of the community. Co-financed by the Fund’s Toronto affiliate and the government of Artsakh, the sponsors also provided the school with all necessary furnishings, including a computer room and events hall. The hope, according to the school’s principal, is that the building’s modern amenities and well-equipped classrooms will be a boon to the learning process, encouraging the current 85-student enrollment to expand to its 130-student capacity, designed per Spitakashen’s demographic-growth projections. In his speech during the May 6 opening ceremony in Spitakashen, Migirdic Migirdician, chairman of the Toronto affiliate, urged young students to strive to excel at their studies. He believed, he said, that each child has the potential of growing up to become a scientist, artist, engineer, or even president of the Republic. Already the students of the school have taken the initiative to care for their new campus by making it still more attractive; with assistance from the mayor’s office, they planted 50 fruit trees around the building. Community celebrations continued on May 7 with a festive opening ceremony hosted by the village of Sos to mark the launch of its new water-delivery system. The Sos project, which includes a new, 7.6-kilometer internal potable-water network as well as a reservoir, was co-financed by the Fund’s French affiliate and the government of Artsakh. For the past several decades, the residents of Sos, a village with a 300-year history, obtained drinking water from a spring, carrying the precious liquid in buckets to their households. Those days will soon become a distant memory, as the village now has around-the-clock access to a new water-delivery system. In their remarks during the opening ceremony, Executive Director Ara Vardanyan and NKR Minister of Urban Development Anahit Vardanyan conveyed their heartfelt congratulations to the residents of Sos. Other project sites visited by the Armenia Fund delegation included the secondary school of Gishi Village (financed by the Vardanyan Family Foundation, the government of Artsakh, and funds raised during the 2008 Telethon); the secondary school of Chartar Village (co-financed by the Fund’s French affiliate and the government of Artsakh); the No. 11 School of Stepanakert (co-financed by the Fund’s U.S. Western Region affiliate and the government of Artsakh); and that of the future Cardiology Center of Goris (co-financed by the Fund’s French and Lebanese affiliates). Throughout the site visits, delegation members noted the high quality and timely implementation of the construction and renovation projects. While in Artsakh, the delegation was honored with a dinner hosted by Nagorno Karabakh President Bako Sahakyan. The delegation also visited Shushi, where the Fund is currently implementing several infrastructure projects in areas identified by the government of Artsakh as being of high priority. Initiatives include the reconstruction or renovation of streets, residential blocks, schools, the Shushi Public Library, and the city’s Cultural Center. In Shushi, the delegation was hosted by Archbishop Pargev Martirosyan, Prelate of the Artsakh Diocese of the Armenian Apostolic Church, and visited Shushi’s St. Ghazanchetsots Church where they participated in celebrations marking Shushi Liberation Day on May 8.